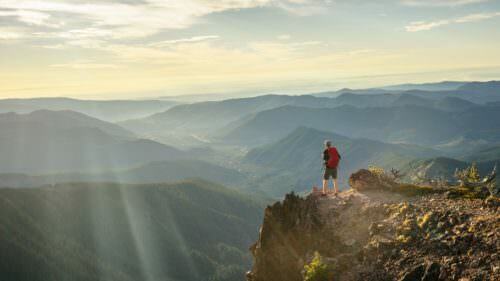 The glacier-caked summit of Oregon’s highest peak creates a dramatic centerpiece for this 100-mile/161-kilometer route that skirts the mountain through fruit valleys and thick fir forest. There are few more iconic symbols of Oregon than Mt. Hood, the state’s highest point at 11,245 feet/3,427 meters and the fourth highest peak in the entire Cascade Mountain Range. Known as Wy’east to the native Multnomah people, it is a dormant stratovolcano that last erupted in the 1780s; just a decade later, British navy explorers spotted it from the Columbia River and named it after a British admiral. Twelve glaciers surround Hood’s pyramidal summit, a peak of incomparable alpine beauty that graces the horizon from Portland to beyond The Dalles. This route provides Hood views like no other as it arcs around the mountain’s base. An hour east of Portland, Hood River enjoys an enviable location where the Hood River, flowing down from Mt. Hood’s glaciers, meets the Columbia River. Long known as a fruit-processing center for the valley’s orchards, today Hood River is equally renowned for recreation. With plenty of public access to mountains, woods and water, this lively town draws hikers, kayakers, cyclists, paddle-boarders and other outdoor enthusiasts. Windsurfers and kiteboarders in particular come from all over the world to skim across the Columbia, fueled by the natural wind tunnel formed by the Columbia River Gorge. A waterfront path links popular launch sites in the port area. From Hood River, the byway leads south on OR-35 through the broad Hood River Valley along part of the Hood River County Fruit Loop. Fertile volcanic soils, glacial water and a temperate climate have made the valley one of the most prolific fruit-growing regions in the world. Pear, cherry and apple trees — and, increasingly, vineyards — checkerboard the valley, along with berry farms, alpaca ranches and hilltop fields of lavender. The Mount Hood Railroad chugs along an old fruit-packing freight line on scenic trips between Hood River and Parkdale. Blooming fruit trees blanket the valley in drifts of pink and white in spring. Farm stands and tasting rooms entice you with the region’s bounty of wine, hard cider and just-picked produce. No matter what the season, the magnificent valley — bookended by postcard views of Mt. Hood and Washington’s Mt. Adams — provides a stunning backdrop. As the byway climbs toward Mt. Hood, the agrarian valley segues into the Mt. Hood National Forest. The U.S. Forest Service office on OR-35 can supply trail maps and a permit if you want to explore its array of mountain creeks, alpine lakes and lush wildflower meadows. The byway bends west around the mountain and past the Mt. Hood Meadows Ski Resort. Crossing the White River bridge, you’ll get an impressive view of the summit and the desolate, ashen river basin. Barlow Pass (elevation 4,155 feet/ 1,266 meters) marks the spot where the Oregon Trail crested the Cascade Mountains in the mid-1800s. A 1-mile/ 1.6-kilometer path from the nearby Barlow Pass Sno Park traces the wagonwheel ruts. When OR-35 merges with US-26, the byway continues west on US-26 to Government Camp, a busy recreational and cultural hub in the summer and winter, depicted at the Mt. Hood Cultural Center & Museum. Nearby, Mt. Hood Skibowl Adventure Park entertains in the summer with alpine slides, Indy race karts and many other activities. From “Govie,” a twisting 6-mile/9.6- kilometer road leads steeply uphill to the majestic Timberline Lodge, a triumph of wood and stone craftsmanship built by the Works Progress Administration in the 1930s. 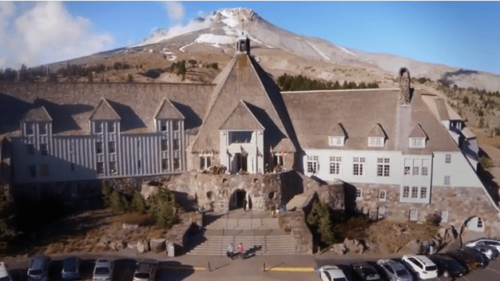 Perched at 6,000 feet/1,828 meters, Timberline Lodge and Ski Area offers dining, lodging, easy access to alpine hikes, North America’s longest ski season, and the best view of Mt. Hood’s summit you can get without crampons and mountaineering skills. From Government Camp, it’s downhill all the way to Wood Village. The steep descent was miserable for Oregon Trail travelers, who had to winch their wagons down a chute on the old Barlow Road at Laurel Hill, just past mile marker 51. Now it’s a pleasant drive, with resorts, restaurants, hiking trails and other services welcoming visitors to the villages of Rhododendron, Zigzag, Welches and Brightwood. Past Welches, the Wildwood Recreation Site is a great place to learn about Oregon’s environment, with interpretive trails along a wetland boardwalk and the lovely Salmon River. The Cascade Streamwatch window built into the bank gives a glimpse at the underwater life thriving in a tributary of this designated Wild and Scenic River. If you prefer casting to watching, several fishing guides operate out of nearby Sandy. Mountain bikers now gather here too, thanks to a growing network of trails on federal lands at Sandy Ridge Trail System, about 11 miles/17.7 kilometers east of town. Just north of downtown Sandy, the Jonsrud Viewpoint looks out across the expansive Sandy River Valley. Mt. Hood looms above, a view pioneers were no doubt relieved to have behind them. The byway continues west along Bluff and Orient roads through an agricultural area known for nursery stock and berries, then into the Portland metro area through historic downtown Gresham, Troutdale and Wood Village. 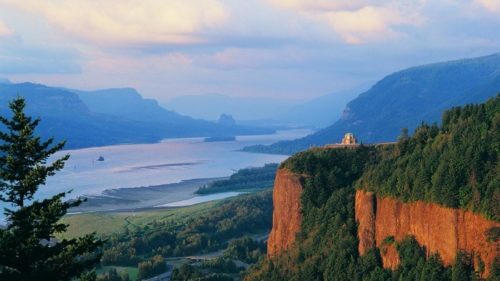 These cities near the Columbia River offer an appealing mix of urban and outdoor activities, with hiking and biking trails, river access, resorts, concert venues, art galleries, great shopping and dining at the western gateway to the Columbia River Gorge National Scenic Area. Order a free Oregon Scenic Byways guide, or view a map of the Mt. Hood Scenic Byway online. Is it better to visit Mt. Hood in the winter or summer?